Originally published in Motorcyclist Magazine. 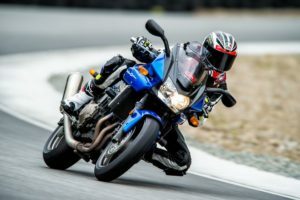 North American sport and sport touring riders have a relative newcomer joining the sport tire fray with the Mitas Sport Force+. It turns out that Mitas (pronounced me-tass) has been around for a while as a maker of agricultural tires, but also manufactures vintage, moped, scooter, flat track, speedway, street and off-road motorcycle tires. The Sport Force+ expands the Czech company’s presence into the modern sport tire category that includes the Michelin Pilot Power and Pirelli Rosso Corsa, among others. response that allowed confident and precise corner entry. Turn-in was not terribly quick compared to a race tire, but just right for a street tire. The bike held its line while trailbraking into corners and stood up as expected when exiting hard on the gas. The moderately stiff carcass provides good feedback and great stability under hard braking. The only negative I found was that feedback from the front tire became vague as I picked up the pace. Reaching knee dragging lean angles was not a problem, but it takes trust to get there. Once off the racetrack, these sticky the tires easily passed the universal “thumbnail test” for perceived grip potential. Curiously, the front tread area wraps far enough around the tire to leave a rather large chicken strip even after reaching knee-dragging lean angles. 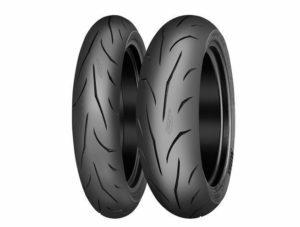 Maximum grip and stability are important features when riding hard on the racetrack, but a sport street tire must also provide predictable manners and a reasonably comfortable ride. In this area, Mitas manages to find a good balance. 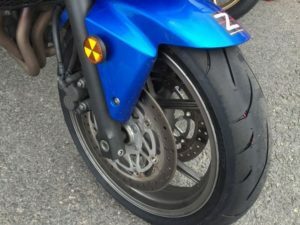 Grip is more than adequate for street riding and the tire rolls into corners consistently and predictably. The somewhat stiff carcass transfers a bit more harshness to the chassis than similar sport tires, but that rigidness also contributes to feel and stability when cornering and braking more aggressively. Cornering characteristics are very good with moderate countersteering effort needed to initiate lean. A slight amount of oversteer happens at about 30 degrees of lean angle with the bike falling into the turn a tiny bit more than expected, but nothing of concern. Pricing is competitive, but not exceptionally cheap, so the reason to consider the Sport Force+ is for its ability to perform at a very high level in all conditions while also providing decent longevity. 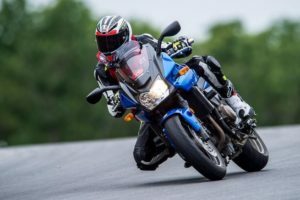 Our test set spent a half-day on the racetrack at a fast intermediate pace along with 1,200 street miles that included Deal’s Gap and the Blue Ridge Parkway. Considering the grip these tires provide, the lifespan is appearing to be surprisingly good. Of course, time will tell just how long they last. Overall, the Mitas Sport Force + is a really good tire that compares well with the more recognizable sport tire brands. Sizing is strictly for 17 inch wheels and ranges from 110-120 fronts and 150-190 rears (You can find a 190 rear for sale HERE). Retail pricing is around $100.00 for fronts and $140.00 for a 180-size rear.